Widely recognised as one of the busiest on course golf discount shops in London and drawing customers from London and all the home counties of Essex, Kent, Surrey, Sussex, Berks, Herts, Beds and Bucks we’re a stockist for all the leading golf equipment manufacturers including Callaway, TaylorMade, Ping, Yonex, Nike and Titleist. If you want to buy Golf Drivers this is the place ! Better than buying golf equipment online you will receive the most comprehensive service possible from our team, including custom club fitting from our dedicated studio on the range and with expert golf tuition and golf lessons from our PGA Golf Professionals at our famous "try before you buy" facility. 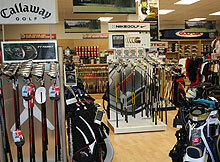 We offer some of the best prices for golf equipment in the UK. In addition to being "the complete golf discount shop", we also stock a wide range of golf clothing including Nike, Adidas and Ralph Lauren. Located for easy access from London, Hertfordshire, Enfield, Hampstead, Barnet and Finchley and the M25, we are open 7 days a week until late. With special discount golf offers on throughout the year, come and see the great choice of discount golf equipment and best prices at londons busiest pay & play golf course. The great location and our close relationship with our golf suppliers allow us to offer unique special events and demo days, which confirms the reputation as "the best golf superstore in North London".